it belongs to a space of time we cannot measure. we can do no more than guess." 0. What do the C14 results say about Gnostic Codex manufacture in antiquity? 3. English Translations of the Gospel of Judas: National Geographic, with selected quotations. 21. Calibrating the "Gnostic Attractor" at 314 CE - When were the Gnostics actively manufacturing codices? 42. Did National Geographic run with the Uncalibrated C14 results? - 280 CE (+/- 60 years) is uncalibrated. 43. Was the Gospel of Judas manufactured "clearly before Nicaea" (325 CE) as claimed by the UA Press Release? 99. Acknowledgements Thanks to Contributors. This article examines the results of the comparitively recent radiocarbon dating tests performed on fragments sourced from an ancient book or codex containing the "Gnostic Gospel of Judas". It compares this result to a theoretical C14 dating of the "Gnostic Gospel of Thomas". The source manuscripts are discussed, along with the general theory of C14 dating. Two distinct process steps are presented in the C14 analysis, described respectively as the "radiocarbon age estimate", and the "radiocarbon calibration estimates". The presentation of the former results is explored by means of standard distribution graphs, while the presentation of the latter is explored by means of the radiocarbon calibration curves generated by the OxCal C14 calibration software. Finally it is noted that - in the absence of the final report from the UA (now ten years overdue) - the generally released publication of the results in the media (eg: National Geographic) may not in fact be the final "radiocarbon calibration estimates", but the penultimate "radiocarbon age estimates". What do the C14 results say about Gnostic Codex manufacture in antiquity? The surprising result of this review article is that, contrary to the published opinions expressed by National Geographic and the UA Press Releases, the Gnostic Gospel of Judas was not necessarily manufactured before the Council of Nicaea (325 CE), but it is just as likley to have been published after this event. By considering the two (one real and one theoretical) C14 results (uncalibrated) as the first two tips of an as yet unrevealed iceburg of C14 results (for manuscripts containing "Gnostic Gospels"), a composite graph is presented with a median value of 314 CE and an error bound of plus or minus 42 years, clearly very close to the Council of Nicaea. Furthermore, the effect of radiocarbon calibration moves this date forward substantially into the later 4th century. It is postulated that a "Gnostic Attractor" will slowly become defined by future C14 results on these types of manuscripts, and will be centered over an epoch that commences very shortly after, and not before, the Council of Nicaea. The manufacture of codices containing "Gnostic Gospels" in antiquity may thus be, perhaps unexpectedly, a post Nicaean phenomenom. An appropriate time period in years still needs to be established between the time the papyrus was harvested, and when it was finally used by the scribe. It is therefore suggested that the "Gnostic Gospels and Acts, etc" were a post Nicaean literary reaction to the NT Canon published by Constantine c.324/325 CE. Until the final report becomes available, and considering what appear to be serious problems associated with the publication of the technical details for this C14 test, it is difficult to understand precisely what the scientific test results were, or even if the results published by various National Geographic sources were the calibrated results. I have no doubt that the scientists know the difference, the question is whether National Geographic did. Of the two more recent manuscript discoveries, the Nag Hammadi Codices (NHC)  and one of the four Qarara Codices, known as the Tchacos Codex [1970's], only the latter has been subjected to radiocarbon dating analysis. Both of these codices bind texts which are categorised by academics as "Gnostic Gospels". However the date of the former (NHC) is generally assumed to be reasonably estimated by other dating methodologies. In the absence of a C14 dating test for the NHC this article assumes a theoretical C14 date equivalent to its current age estimate. The two C14 results (one real and one theoretical) are then compared in order to re-examine the chronology of Gnostic codex manufacture in antiquity. The Gospel of Thomas, appearing as the second story within the second codex (NHC 2.2), within the Nag Hammadi Codices discovery, is dated by papyri material found in the covers of the codex (dated receipts) to c.348 CE. Since a C14 test has not yet been conducted on this codex (or any of the others to my knowledge) a theoretical C14 date of 348 CE plus or minus 60 years is assigned to it in this article in order to make some theoretical comparisons. Codex Tchacos, containing the "Gospel of Judas", is one of the Four Qarara Codices. This Tchacos Codex is an ancient Egyptian Coptic papyrus containing the following four Gnostic texts, and in 2005 samples from it were subjected to radiocarbon dating analysis tests at the University of Arizona, with the result as published in consultation with National Geographic, as 280 CE plus or minus 60 years. The Gospel of Judas and the Qarara Codices - SOME PRELIMINARY OBSERVATIONS, by Peter M. Head, Tyndale Bulletin 58.1 (2007) 1-23. According to the account of the discovery of the codex reported by its early owners, the codex containing the Gospel of Judas was discovered during an illegal �excavation� of a tomb near Jebel Qarara, 60 km north of Al Minya on the right bank of the Nile in Middle Egypt (or 8 km south of Oxyrhynchus).6 This codex was apparently not alone, but was found in a limestone box with three other codices.7 The four codices were: a fourth- or fifth-century papyrus codex containing the book of Exodus in Greek; a papyrus codex containing Coptic gnostic material (Codex Tchacos which includes the Gospel of Judas); a fourth- or fifthcentury papyrus codex containing the letters of Paul in Coptic; and a portion of a mathematical treatise in Greek: Metrodological Tractate. Neither the collection as a whole nor the individual manuscripts have survived intact, indeed several have been deliberately split into portions by dealers anxious for a sale. The sad demise of the other three Qarara Codices is mirrored and perhaps magnified in the fourth codex of the limestone box, that which contains the Gospel of Judas and has become known as Codex Tchacos (after and by the current owner, Frieda Tchacos Nussberger). To this we now turn. The Letter of Peter to Philip is a tractate of late second- or third-century date, which was named after the letter with which it begins, but which is basically a narrative vehicle for a series of revelations from the resurrected Jesus (for a brief introduction and ET by F. Wisse see The Nag Hammadi Library in English, [hereafter NHLE] ed. J. M. Robinson [Leiden: Brull, 1984]: 394-98). Notably different from GJudas, The Letter of Peter to Philip reinforces both the leadership of Peter among the apostles and the importance and status of the apostles as recipients and witnesses of these special revelations. Nor is the Gnostic outlook identical to that exhibited in GJudas. Entitled The First Apocalypse of James (NHLE: 242-48) in order to distinguish it from The Second Apocalypse of James (NH V.4; NHLE: 249-55) although both originally had the same original title, simply �The Apocalypse of James�. The revelation of which the title speaks takes place through a dialogue between Jesus and James the brother of the Lord (although the opening speech of Jesus qualifies this relationship: �It is the Lord who spoke with me: �See now the completion of my redemption. I have given you a sign of these things, James, my brother. For not without reason have I called you my brother, although you are not my brother materially.� (NH V.24.10-17; NHLE: 242). Gospel of Judas - Main Index Page at National Geographic. THE GOSPEL OF JUDAS Translated by Rodolphe Kasser, Marvin Meyer, and Gregor Wurst, in collaboration with Fran�ois Gaudard. now also listen to me. For I have seen a great vision." "You thirteenth daimon, why do you try so hard? But speak up, and I shall bear with you." "Master, take me in along with these people." "Your star has led you astray, Judas." and it was never called by any name." "Let twelve angels come into being to rule over chaos and the underworld." which means in translation 'rebel'; others call him Yaldabaoth." so that the kings of chaos and the underworld might not lord it over them." [--Jesus]"
and your star will rule over the thirteenth aeon." And after that Jesus laughed. Judas said, "Master, why are you laughing at us?" and they all will be destroyed along with their creatures." "But you will exceed all of them. For you will sacrifice the man who bears me. and your star has passed by, and your heart has become strong." [--Jesus to Judas]"
"Look, you have been told everything. and the light within it and the stars surrounding it. And the star that leads the way is your star." So Judas lifted up his eyes and saw the luminous cloud, and he entered it." "Before the Present (1950) as WIKI - The year 1950 is designated zero years before the present. Radiocarbon Calibration - Some portions of the calibration curve are smooth; in these regions, we can obtain a "calibrated age", with an error similar to the measurement error for the "raw" age. At other points, fluctuations or "wiggles" in the curve can result in points where a line of constant radiocarbon age intersects the calibration curve in several places. In this case we may need to include several discrete age intervals, and this can result in a larger range of possible calibrated age than would be expected from the errors in the measured radiocarbon content alone. Peter M. Head, Tyndale Bulletin 58.1 (2007) 1-23. Papyrus from page 33: AD 279 +/- 47 years. Krosney reports that the anomalous loose fragment, which registered a much later date than the others, was therefore discounted since it �was apparently not part of the manuscript�. Combining the four other samples suggested a 95% statistical probability that the codex was created between 220 and 340 AD, with a statistical mean of 280 AD. This, Krosney clearly implies, is more authoritative than the previous estimates based on paleographical analysis. Krosney, The Lost Gospel: 269-74. The analysis is attributed to Tim Jull, director of the NSF-Arizona Accelerator Mass Spectrometer Facility in the University of Arizona, Tucson. Krosney, The Lost Gospel: 274. Additional problems can be perceived highlighted in the above summary. A date of 1739 radiocarbon years is given as 279 CE for page 9 of the manuscript. A date of 1726 radiocarbon years is given as 279 CE for page 33 of the manuscript. These figures just do not add up. It is clear that the report of Peter Head (above) uses the two 279 CE figures, but why are the two radiocarbon age figures different in Krosney's summary? And what are the correct results? We should be able to simply look at the final scientific report, but it is a decade unpublished for peer review. What is happening here? The computed results are shown above. Based on the given uncalibrated C14 results, the probability that both codices were manufactured after Nicaea is 15%. We need to now look at the process of radiocarbon age "calibration". All the above discussion related to the radiocarbon dating of fragments of the Gospel of Judas has so far been restricted to the discussion of the radiocarbon age estimate. This is the penultimate step in the standard process of radiocarbon dating, and the results are expressed as a normal distribution about a meduan figure (here 280 CE), associated with equal error estimations (such as plus or minus 60 years). One further step is usually conducted in the publication of C14 results, and that step is generally called the step of "Calibration". Consultative and collaborative analysis has determined the profile of the variation to the standard in the radiocarbon age expressed above, needs to be subjected itself to a radiocarbon calibration. Various calibration software is available for this purpose. The effect of "Radiocarbon calibration" is to project the known and established asymmetries of the C14 levels in the most recently published "Calibration Curve" against the standard distribution above. (1) The Radiocarbon Age Estimate as a Normal Distribution (Red) - shown at the top left. (2) The Calibration Curve - shown as the band descending left to right. (3) The Calibrated Radiocarbon Result - shown as the multi-peaked distribution at the center. As can be seen, the process of radiocarbon calibration changes the "radiocarbon age" of between 220 and 340 CE to the "calibrated age" of between 240 and 540 CE. All the above discussion related to the (theoretical) radiocarbon dating of fragments of the Gospel of Thomas (NHC 2.2) has so far been restricted to the discussion of the radiocarbon age estimate. This is the penultimate step in the standard process of radiocarbon dating, and the results are expressed as a normal distribution about a meduan figure (here 348 CE), associated with equal error estimations (such as plus or minus 60 years). As can be seen, the process of radiocarbon calibration changes the "radiocarbon age" of between 288 and 408 CE to the "calibrated age" of between 330 and 600 CE. In the following graphical presentation both of two separate C14 results are displayed together with their respective median peaks and error bounds. 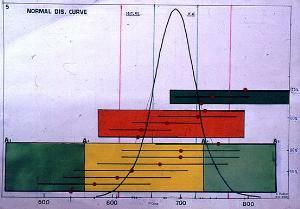 A third analytical curve is shown which represents both curves, on the basis that both results are in respect of the one category of test material - ie: "Gnostic codices". The dimensions of the individual uncalibrated normal distributions is probability density, while the dimensions of the derived overview distribition is a measure of probability. Do we have an "attractor" after Nicaea (325 CE)? As can be seen, the result of the radiocarbon calibration process changes the range to between 210 and 420 CE. Are we dealing with the uncalibrated result for the "Gospel of Judas"? Has National Geographic published the uncalibrated results? The National Geographic Society submitted five tiny samples of the Gospel of Judas for AMS testing at the University of Arizona's radiocarbon dating lab in Tucson�the same lab that dated the Dead Sea Scrolls. The Judas fragments included four minute pieces of papyrus and a small bit of the book's leather binding with a piece of attached papyrus page. No part of the ancient script was altered or damaged during this process. The results allowed lab experts to confidently date the papyruses to between A.D. 220 and 340. "The calibrated ages of the papyrus and leather samples are tightly clustered and place the age of the Codices within the third or fourth centuries A.D.," reported Tim Jull, director of Arizona's AMS facility, and research scientist Greg Hodgins. Various calibration software was available in 2005/2006, and the AMS webpages dedicate a page to the calibration process, so its difficult to imagine the results would not have been at some stage examined after plugging in the year 280 +/- 60 years into some software. The UA scientists completed the radiocarbon dating tests in early January 2005. We have seen above from Peter Head's article that the final report for the test was not available in 2007. In 2015, ten years after the C14 test, the final report has still not yet been published by the UA team. This lack of publication is most likely to do with confidentiality and publication agreements with National Geographic, which these scientists may have had to enter into as part of the entire publication process driven by National Geographic. However at the end of the day there appears to be a great many questions to this C14 test which can only be answered by the final scientific report, now a decade overdue. One possibility is that, for one reason or another (and perhaps unconnected with scientific process), National Geographic has run with the uncalibrated figures. Was the Gospel of Judas codex manufactured before the Council of Nicaea? A. J. Tim Jull, director of the National Science Foundation-Arizona AMS Laboratory, and Gregory Hodgins, assistant research scientist, radiocarbon dated five tiny samples of papyrus and leather book binding from a collection of ancient documents, known as a codex, that was discovered only about 30 years ago in Egypt. "All five samples, remarkably, are the same age," Jull said. "All date to the third to fourth century, clearly before the Council of Nicaea, which presumably would have suppressed such a document." This last statement that the codex must be clearly dated before the council of Nicaea (325 CE) is very questionable on two counts. (1) Firstly, the year 325 CE is within the upper (uncalibrated) error bound of 340 CE and is thus still feasible. (2) Secondly, after calibration, the upper bound becomes 540 CE, and the mean becomes 390 CE, well after Nicaea. As demonstrated above, after the calibration process, the estimated dating for the manufacture of Gnostic codices in antiquity suggests that what the above press release reports A. J. Tim Jull to have stated is inaccurate. The results suggest that Gnostic codices were manufactured during an epoch centered about an uncalibrated date of 314 CE, which when calibrated -- and increased by the number of years the papyrus sat on the shelf - yields equally validly a date well after Nicaea (325 CE). I would like to thank many people for their contributory ideas and suggestions, criticisms and observations, in regard to this article, and the data it attempts to present. Perhaps the most significant source of discussion and contribution arose from a thread called Questions about C14 dating, Bell Curves and averaging two independent C14 results.. Particularly I should like to thank "cold one" and "Requiem for your dreams" for the graphs. More recently I would like to thank Peter Kirby for two articles dated 8th March 2015 in which he critically and objectively addressed a previous revision of this page on C14 dating the Gnostics. His two articles are: gospel-of-judas-radiocarbon-age-results and nag-hammadi-carbon-dating-myth. In the former article Peter Kirby does an independent and objective reassessment of the situation with the all the available sources of the publication of the results of the UA C14 tests. In the latter article Peter Kirby complained about an overdue revision of this article on the basis that a real C14 test on the Gospel of Thomas (within the NHC 2) had never been published. This was true. There was an oversight. Peter Kirby reports on the details. As a result, this article has been adapted as a theoretical exercise - a thought experiment. A theoretical radiocarbon age date is allocated to the 348 CE date generally ascribed to date of the Nag Hammadi codices, in order to see what a comparison of two C14 tests might be able to reveal in terms of likelihoods and statistical probabilities related to the chronology of the manufacture of gnostic codices in antiquity. However, P. R. F. Brown can be credited, at least, for raising interesting questions regarding the distinction between the calibrated dates and uncalibrated data and for asking the question of how Jull arrived at his final results, and thus for prompting some of the further questioning on these matters, including this blog post. "My estimation following Peter Head�s thesis leaves a radiometric result in the late third through the end of the fourth century." So ten years later the National Geographic Society grants permission for the actual results to be made available. Isn't that encouraging? This article will be revised as necessary when further data becomes available.